Facebook is now charging money to send messages to celebrities and people not in a users contact list. In December the system was implemented in the United States and according to the social network it’s not a way for Facebook to make money but a measure to reduce spam. 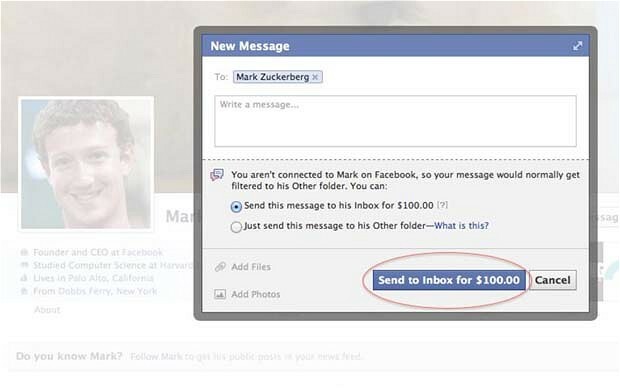 In January, a Facebook user who wanted to send a message to the network’s founder, Mark Zuckerberg, received a pop up message asking him to pay $100 if he wanted the message to be delivered to Zuckerberg’s inbox, if he did not pay the $100, the message would be delivered to the “other” inbox. “The main objective is to prevent spam”, explained Facebook’s communication department. “If a person wants to send you a message and they are not on your friend list, they have to really think before they send it”. According to Facebook, the base rate for sending messages is calculated by how many followers a person has and not by popularity. In the U.S., prices ranges between $1 and $15 dollars, in the UK, the rates range from $0.83 to $12.5 Euros. To message a journalist you would have to pay between $1 and 5 dollars and the price goes up for celebrities and sports figures. “This system applies only to personal profiles, not pages, and the charging pop up message is only shown at most once per week,” Facebook explained. Although Facebook will make make money from people sending messages to celebrities, they will not receive any percentage of the proceeds. The fee is justified to prevent spam, and the message is always sent and it reaches its destination, just to a different mailbox. Would you pay money to send a message to a celebrity? If so who would it be?